The bidding process for the Phase 3 of the Laem Chabang port expansion will take place in October, informs Bangkok Post quoting Songtham Chantaprasit, acting director-general at the Port Authority of Thailand (PAT). The project’s terms of reference are still to be finalized within the next two months by PAT, but once bidding commences, winners will be announced in November, he said. The construction of Laem Chabang port Phase 3 is estimated to cost Bt 140 bln (USD 4.5 bln). The ambitious mega-project of the Thailand’s main deep-sea port expansion in Chon Buri has been fast-tracked by the government as part of the Eastern Economic Corridor (EEC) Development Plan implying significant investments in infrastructure and innovation of Thailand. Initially, EEC is set to be focused on 3 eastern provinces: Chachoengsao, Chon Buri and Rayong. 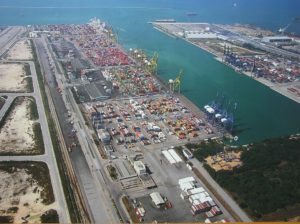 While the port project also includes the construction of railway connections to the port to facilitate cargo flows, its main part involves extending the port’s area by massive land reclamation covering several hectares of coastline in the Laem Chabang area, in Chon Buri’s Si Racha district. This raised concerns at communities living near the port about the coastal fishery resources. The environmental health impact assessment was completed by the PAT and sent to the Environmental Impact Evaluation Bureau for approval in February. The Port Authority does not preview any delay with this and expects it to be approved within 6 months, as projects under EEC are considered faster than the normal practice. Once the environmental permits are granted, PAT will start the international bidding process to choose potential port terminal operators. The Phase 3 construction is said to begin early next year, with the start of operations planned for 2025. Phase 3 will increase the current Laem Chabang’s capacity of 11 mln TEU up to 18 mln TEU per year. The rail deliveries are also expected to be increased by 23%. In 2017, the port handled 7.7 mln TEU.